I don't know who Derek Fernandez is trying to attack with his remarks - the Federal government run by his political foes or the Malaysian Civil Service - but I know it's uncalled for. I also know there are just too many monkeys like him around. Orang Melayu panggil perangai macam ni kurang ajar. THE transfer of Petaling Jaya City Council (MBPJ) Mayor Datuk Mohamad Roslan Sakiman to the State Secretariat is a promotion. Chief Secretary to the government Datuk Seri Ali Hamsa attempted to clear the air over the controversial transfer saying that it was not a lateral transfer as suggested by certain parties. “We are promoting him to a higher position. He will head the State Economic Planning Unit (UPEN),” Ali told The Malay Mail. “We had spoken to the mayor and he feels the move to the State will be good for him as it is a promotion with more benefits,” Ali said, adding that several candidates had been identified to take over from Mohamad Roslan, who is scheduled to be appointed deputy state secretary (development) on Dec 1. Councillor Derek Fernandez said while MBPJ was against a lateral move by the Public Services Department (PSD), it would have no objection if it was a promotion that would benefit Mohamad Roslan. However, he insisted that the choice of mayor, including Mohamad Roslan’s transfer must be on the endorsement of the state. “If what the chief secretary said is true, then it is good for Mohamad Roslan. “If he is moving up to a Superscale B (from the present Superscale C) then it is good for him,” he said. According to Fernandez, the post of mayor is an open one under the Local Government Act (LGA 1976) and the state government is allowed to appoint its own candidate. He said MBPJ would also issue a letter to the PSD to offer it the opportunity to jointly petition the court to determine the law as to the appointment of federal officers. MBPJ's full board meeting had on Nov 2 decided to seek a judicial review to prevent Mohamad Roslan's appointment to the State. Fernandez said the council would seek answers as to whether it is correct procedure for the PSD to issue a lateral transfer to a sitting mayor who is a Superscale C officer in the absence of a sitting director-general of the PSD. "We want to know if the deputy has such power to transfer and if so under who's instructions," he said. Mohamad Roslan's transfer letter dated Sept 27 was signed by PSD deputy director-general Datuk Faridah Mohd Ali. It was sent via the office of State Secretary Datuk Mohd Khusrin Nawawi, whom Mohd Roslan was supposed to report to. He was originally given only three days to report for duty, creating a storm in MBPJ as the city council would have been left without a mayor. At the same time, the deputy mayor Datuk Puasa Taib was on extended sick leave. 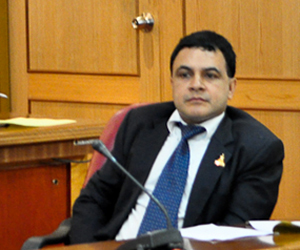 Mohamad Roslan will now take up his new post on Dec 1 — that too, said Fernandez if there is an acceptable replacement. "Otherwise the State will source its own candidate." If Derek Fernandez's ancestors have not been shanghaihed into slavery by the British he would still be languishing some where in the Indian sub-continent wearing a dirty sarong chewing sireh and beetel nut wondering how to enter Malaysia illegally, yes these ingrates are truly showing their true racial colour! Fernandez looks more like a baboon in a suit. Dressed up a boaoon in a suit and put it next to Fernandez... you wouldn't be able tell who is who between them. Stick to the main issue Rocky. If you still want to do it, be fair lah. Ibrahim Ali also rattles a lot, but it never caught your attention. The Home Minister recently said - do not mix religion with politics, but see what his cousin did in Batu Caves yesterday? I see a 'monkey trait' in that too but that is not the issue. The main joke was BN approving a project in 2007and now saying that it will cancel it if it comes to power in 2013. You are getting more worried/serious of late, especially with the changes at NST, so much so you cannot see the humour aspects in what politicians from both sides of the divide do/say. You still can, if you remain neutral, but that word is now alien to you. All in the name of 'cari makan'. I totally agree with Fernandez comment.Najib as PM prefer to feed the monkey than feed anak sendiri. Look at the Security commision new chief a Singh.Tak ada Melayu yang layak ka. look at KSU Trade,a Portugis Lady.Tak ada Melayu layak ke. Look at KSU Ministry of finance,India Islam.Tak ada Melayu ka. So Fernandez,I think Najib will send another Monkey to be the new Mayor. Typical! Anyone with "Fernandez" name have attitude problem. Just like Tony F. These people will get angry if you wish them Deepavali!! Looks and behaves like Monkey!! Ini semua disebabkan Melayu terlalu baik, terlalu pentingkan adat sopan. Bukan Melayu makin naik tochang mintak itu dan ini. Balik pada Perlembagaan Persekutuan - habis cerita. Derek, u pegi bukak baju u tengok u punya badan penuh bulu ada sama ka macam monyet!!! parameswara -- go kacau another blog-lah. you are so predictable. as for me derek fernandez -- Rocky -- they're all the same. Everyone else bodoh but them. Of course, there are are monkeys around. In Pakatan -- abundant. what mr derek fernandez meant -- kalau melayu, monkey-lah. All of you real DUMNO. There is oredi 1 monkey, it is real DUMNO to send another monkey. Send another Issac Newtown to shame PR. And look at the other 99.9% of top civil service posts, the exclusive club of the privileged. Takde lain yang layak ka? PS: funnily all the nons are somehow holding many top posts at other neighbouring countries. PS: Bru, very clever use of Malay pepatah to light the fuse. Batu API style. Recently the slightest rebuke from a non Malay invites comments about how patient and tolerant Malays are and what ingrates the non malays are Look here they may be non Malays but they are not non Malaysians. They are all citizens. This country is what it is today because of people of all races. Politician from both sides lack finesse in their arguments/counter arguments. Both sides are more interested in Bashing/thrashing/twisting rather than doing the actual work. Parameswara, its ok to disagree but we should not resort to calling individual monkeys. Would you tolerate if people were to call you monkey? only a monkey will recognise a monkey - bodoh punya india mat salleh celup! hei mapley derek who the hell do you think you are using such a lingo. you look like a baboon in a dress. Ini bngsat ingat dia bangsa yg tinggi Darjatnya drpd Melayu...melayu monyet pada matanya dan parti keadilan dan Dap...yg hairanya masih melayu yg terkinja2 menyokongnya spt monyet. Pasquale - U have shown ur true racist colour. The British enslaved ur ancestors based on their skin colour, and now you enslave ur own mind with ur racist attitude. If you had commented bout what the issue is, it would have been fine. But u had to bring in some race matters. Ppl like u ensure Malaysia remains enslaved by racism. Why this blog got so many monkeys reading it? First time and last time for me. Monkeys means clowns or more or less idiots sitting as Mayor and dunno how to do a job ..Half baked chekai civil servants sitting on too big a chair.! Maybe you are slighted because it happens most civil officers happens to be melayus.We could'nt care less if its a melayu ,chin or india...if he does the job good and fair ,but its majority malays is'nt sitting in top gun post? Well PJ has almost all clowns as mayor for a long time.Period! Being neutral has nothing to do with the issue at hand. And the issue is about this dude's attitude. Derek Fernandez is not just arrogant, he's saying that he's got muscles and he will flex those muscles just to show he's boss. We don't have to like this behavior. Pakatan Rakyat was a modest outfit before 2008, you and I know it. Let him defend himself lah Param ... you don't have to stoop that low to cari makan yourself .. I don't know what's the deal with the transfer. It just a promotion for God's sake. Selangor actually is Federated Malay state, together with Pahang, Perak and Negeri Sembilan where the appointments of its civil servants are done by Public Services Commission(PSC). And the postings and transfers of those who have been appointed by PSC are done by Public Services Department (PSD). The PSC have a power to appoint where else the PSD have a power to move people around. Unlike Johor, Terengganu, Kelantan, and Kedah, the appointment and transfer of state civil servants over there is wholly under the purview of their own state services commission, i.e. the state government. The bottom line here is the appointments and transfers of officials in Federated Malay states are under the juridiction of the federal government. It is the federal government who pay their salaries, not the state government. The state government has not right to meddle in the affairs of PSD the way the federal government have no right to interfere in the affairs of the Unfederated Malay states. I'm not sure how Derek and his friends wanted to challenge that under Local Government Act but the distinction is clear. if they want to go ahead then be it. And then they also look to challenge wether the deputy acting as Director General has a power over matters regarding transfer. It shows that they themselves are not sure on what ground they should challenge. CAnd calling the civil servants as monkeys won't help your cause either. These are the people who had put you and your people to power 4 years ago. Even if you have low opinion on them but to brand them as monkeys is just unthinkable. Never underestime the power they have. FYI, some of the D.O.s have a power to sway voters in their area. oh, Derek you're still novice in politics..
Its so easy for BN to win next election. Just let these PR goons menkeying around. Good for you,nobody invited you,but I am not sure this will happen.Bolih BLAH. Fernandez is the head of all mongkeys there, so fernandez one more does not make any difference i suppose. After all u have done a lot of mongkeys business before. I suppose mongkeys really think they are better educated then others. If u are in the same class, thats y u sound like one too. You are no angel either. Look back at your outbursts. Quite a number of people have been branded as 'morons' by you. If you can do such judgemental branding, no harm for another to talk about monkeys. Kalau nak tegur/nasihat orang, tunjuk teladan dulu Dato. Jeremy and mss, if you miss the point, too bad lah. Lets see if more 'morons' are identified in this blog! Surprisingly the 'morons' are always on the other side of the divide. Dato can see the ants there, but not the elephants on the side where he is! Try convince us that the ones on this side are angels! Whatever the case may be, Dato is allowing freedom of speech/expression in his blog, and that is something we all enjoy and cherish. That damned Derek lingam refer that person holding that post to alike a monkey. Who the hell he thinks he is? I agree with Pasquale on this, if every DAPigs can start insultimg what and who then these Dapigs must remember the pariah they once were. Agree with Anom 8:22. The appointment of a mayor in Selangor is bound to Local Government Act 1976. Really? Then the previous appointments of Datuk Mohamad Roslan as mayor of MBPJ and Datuk Zainal Abidin of MPS and the other guys before them over there could be considered as unlawful too because they were there in the first place because of PSD directives. The PSD had put them there but they can’t remove them elsewhere. How come? A monkey like Fernandez? I wish those Pakatan pricks will have 10 more monkeys like him, BN will win any PRU hands down. Thank you for all the good things you have done for us since Merdeka. Our country is now famous with top of the world things like KLCC, F1, long bridge, sports kings and queens. Also cheap/free study fee from schools right up to varsities. Cheap loans, notwithstanding conservative stance in monetary policies. Cheap petrol at RMM1.90 per litre. and also thank you in your effort to raise up the income level. An uphill task no doubt but pls continue. There is so much proof that BN has served us rakyat well.We are the judge the jury and executioner by just a vote. Senangnya meminta maaf dan mengatakan kenyataan diputarbelikkan. What do you think? We are not monkeys lah! Cakap malam dengar-dengar, cakap siang pandang-pandang. Terlanjur perahu boleh ditarik, terlanjur kata buruk padahnya. Apology NOT accepted. The fact is he used the word MONKEY in the interview with The Malay Mail to refer to some civil servants. Despite clarifying his uncalled-for, derogatory stereotyping of civil servants statement, which forms the crux of Ceupacs criticism, he went to the extent of threathening the body with legal action. Excuse me, I read the Malay Mail article and he did refer some civil servants as MONKEYS. What are you trying to spin saudara Ben? Rakyat knew who's the Alpha Male... or Female !!! Mintak maaf, tahupun salah, lepas tu nak sue, masih nak pusing. Betul2 monyet seekor ni. On behalf on the Persatuan Monyet-2 Bukit Gasing, I would like to appeal to all not use a monkey's name in vain and discriminate us from public office, as we have been steadfast pre-Merdeka residents of PJ. Whilst you lot only ramble about paying peanuts, we have a reelected Primate-in-Chief at the Oval Office and leave you to ponder why Democracy is the art of running the circus from a monkey cage. Pada saya Derek tidak berhati besar dalam isu ni. Dia sepatutnya menarik perkataannya. Laporan Malay Mail sudah jelas tapi dia masih nak tegakkan benang yang basah. Semua ini kerana ego Derek sendiri. Dia patut mengambil iktibar terhadap keceluparannya itu. Vote for BN. Vote for the troop of monkeys. It's led by an alpha female with a fetish for stealing handbags.